We've used this runner in our hallway. The rug is holding up beautifully under heavy traffic for almost 2 years now! We found that, even with a non-slip pad underneath, the rug would still shift and bunch (it's thinner with the flat weave), so we've used carpet tape to tape it to the floor. Now it doesn't budge and I can vacuum in easily. This was a great purchase for us. 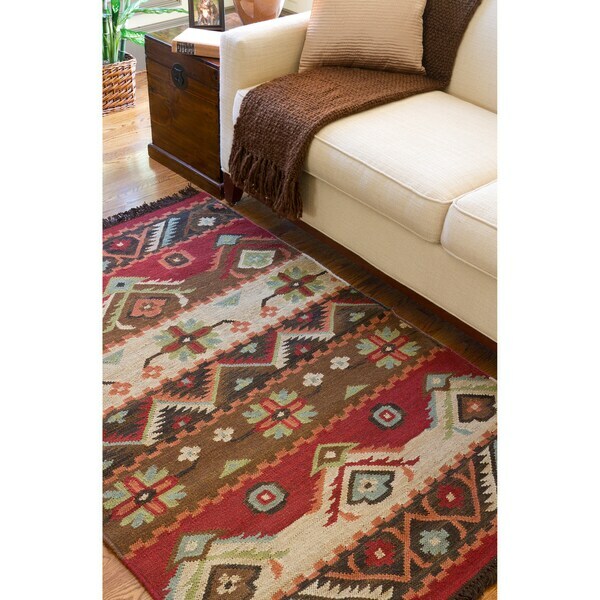 Hand woven of wool, this rug features a southwest design and flat pile. Shades of red, brown, beige, turquoise, sage, black and gold accent this area rug. This beautiful, tasseled area rug will warm up any living space. Featuring exciting south-western designs, this hand-woven wool piece will bring life to any bedroom, living room,entryway, or accent wall. It's a perfect accent piece for a more modern design, or a wonderful addition to a more rustic setting. The "color question" concerned me, as did the cost of return shipping, but when I kept coming back to this rug in my search I decided to take a chance. It is absolutely beautiful, and the colors are warm and rich ~ very similar to the photo of the rug in front of the sofa. As far as I'm concerned, the mfg needs to take new close-up/full size photos, as the dark pictures are totally misleading as to color! It is excellent quality, lays flat right from the get-go, feels good underfoot, and is a typical (or perhaps even a tad heavier) weight for a flat weave rug. I put a rug pad (item 13044045) underneath; it added some cushion, and really keeps the rug in place. We are delighted with this purchase! The photo provided online makes it seem like a dull rug, but this is a great rug. A light blue color stands out more and the color/pattern combination is beautiful. I don't have a rug pad since this rug is under our kitchen table (not in a high traffic area). Easy to vacuum! I have been looking at this rug at a local store...after searching the brand online the least expensive rug I could find was 3x more than it was on Overstock!! I knew by the picture and description that it was the same and was shocked to see that it had the label of the brand that I had been shopping for (even though it was not in the description on Overstocks website) The rug is as beautiful as I had hoped, southwestern but not garish, perfect for my mountain home. The colors are more muted than they appear online, which is what I expected since I had seen it in person before purchasing. I can't believe how lucky I got to find my dream rug at this price!!! This rug is so pretty. If you zoom in on it, you can see for yourself. It is a colorful, playful, casual rug. Sometimes when so many colors are woven into a rug, one or two of the colors can seem "off," but not this one! I'd describe the colors as burlap tan, dark brown, black, dark red, terra cotta, muted light blue and muted light green. This is a terrific quality, statement rug for such a small price! Beautiful, high quality flat weave rug, looks just as pictured. Typical weight, lays flat, not easy to trip on. Rug available elsewhere for at least $100 more. Love this rug. It has a Native American woven look and a nice color balance. The red really sets off our rustic living room. I also got the non-skid pad, which I would recommend as it does slide. The brown tassels on each end are a nice touch. I was initially concerned about the colors but they were spot on! If not in a fully lit room they may look a little muted but definitely not as dark as one of the pictures. More like the other two as displayed in a room. Quality looks excellent. We added a rug pad underneath. This rug would look good in probably any room in your house if you like the motif. Couldn't be happier with it. Color: Color wise it leans more towards the more muted colors, which I'm glad for since that's what I was looking for. It's definitely not as bright as the picture depicts with the couch. You will need a rug pad for this rug as it's thin. It's also a little scratchier than I had anticipated but is kind of a bummer but the price of returning isn't really worth it. This rug is pretty good quality, and the actual colors are somewhere between the photo where they look bright and the photo where they look more earthy. It does change a bit depending on the lighting, but overall - a great quality rug that looks like the pictures. This is beautiful! We love it. It does slide so I would recommend a rug pad to avoid slipping. It was a gift so I haven't seen it in person but the report is they love it. I got a picture and it looks great with their western and native decor. Great value for the size. I like this rug. I"ve bought several rugs on Overstock and I've always been pleased with them, and with their prices. Really pretty and great quality. Just what I wanted and very inexpensive! This is a really nice rug and I am very happy with my purchase. Most importantly though, the customer service at Overstock is outstanding! The first rug I ordered was not the color I wanted and they switched it with no problem at all. Beautiful and well-made. It fits our Arizona decor quite well. Only regret is the fringe on the ends. Would like this rug a lot better with straight edges. Nice rug. Great colors and texture. We love the rug. It is of very high quality. The price was good compared to other shops. It was advertised correctly. We are happy with the purchase. Great colors/pattern, easy to maintain. It's placed in a sunny room and were concerned about fading - colors have not faded. "Is there a detail image? That would help a lot!" At this time we do not have any additional images, however you can zoom in on the images provided. "I am considering buying this rug for my baby's room. She will be sitting/crawling/playing on the rug. Is it soft?" This rug is made of wool which will not be as soft as a cotton rug. We recommend reading customer reviews for first hand accounts of the item. "Does this ru come in an 8x10"
"What is the weight on this rug?" The rug weighs 53 pounds. "does this rug come in 8x8?" This rug is currently not offered in a size 8 x 8. We apologize for the inconvenience. "What is the return policy on item 13684034 if ordered today? Who pays the return shipping fees?" Items should be returned in new or unused condition with all original materials included with the shipment. We ask the buyer to cover return shipping charges should the rug not arrive damaged. For more on our standard return policy: (https://help.overstock.com/app/answers/detail/a_id/1). "Is this rug reversible? What is return policy?" No, it is not reversable. This rug is not reversible and you can initiate a return for most new and unopened items within 30 days of delivery for a full refund.